Our show is an excellent opportunity to promote your business, sell your products/services and network with other businesses.Below you will find the forms you require to apply to this years show. Please fill them in and return to us by email or post. We have various trading areas throughout the showground, as well as a Shopping Marquee, Upcycled/Handmade Marquee and Food Market. On this page you will find the forms you require to apply to attend the show on 7th & 8th September 2019. Please print them off complete by hand and either scan and send them to us by email, or post to us. A fantastic way to promote your brand to an average 30,000 people, supporting the biggest two day agricultural show in the North East. Sponsorship starts from as little as £100 to becoming a Principal Partner with the show, everyone benefits. Preference is given to sponsors. Information pack – provides a quick overview of the type of trade stands that are available, we have lots of great options: Outdoor Trade Stands, Indoor Shopping Marquee and Upcycled & Handmade Marquee. It also gives detailed tables of prices, ticket allocation and vehicle passes and information on advertising etc. Closing date for applications is 20th July 2019. If you wish to promote your cakes, drinks, pies, breads, or any fresh produce, this is the place for you. 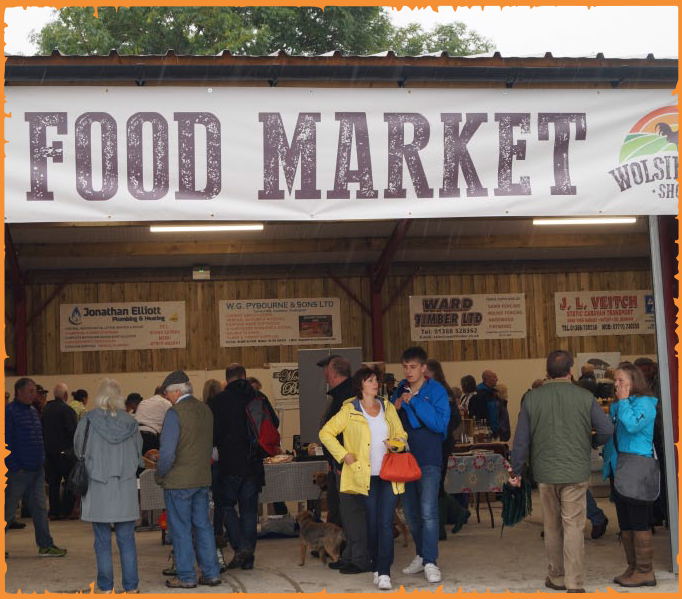 This market situated in both the Barn and a marquee allows visitors to browse and often nibble and sip to sample the wonderful produce from around the county and neighbouring counties, once tested they can purchase your goods and spread the word how great your produce is. Closing date for applications is 20th February 2019. Please note that all stands must be set up by 8am on both days and we would prefer larger trade stands to be set up on Friday. For greater security and to prevent delays entering the showground, please ensure that your vehicle pass is clearly on display. All vehicles entering the show field must have a vehicle pass. The allocation of sites will be at the discretion of the Organisers, and athough every endeavour will be made to meet the exhibitor's particular requirements, it is not always possible to allocate the exact space applied for in all cases. It has been the Organisers policy to offer exhibitors who have previously supported the show the same site as that occupied in the previous year. Full payments should be paid by BACS or cheque -made payable to Wolsingham Show. Please note that submision of an application form does not guarantee a space. All Charities must apply for a trade stand in the usual manner and also write requesting a discount that may be given at the Committees discretion. This discount is only offered to a limited number of charities each year, the Committee selects charities on individual merit, choosing different onces each year to enable as many worthy causes as possible to benefit from this discount. If you wish to be considered for a charity discount please enclose a letter stating the method of fund-raising or promotion and includng the registered charity number with your booking form. Application for space must be made on the official forms, downloaded below, which must be completed and signed by the exhibitor or his authorised agent and forwarded to the Show Secretary. If you would like to discuss any aspect of your booking prior to completing the forms please contact Mr D Richardson who will be pleased to assist with your enquiries. A Trade Exhibitor with Stand space reserved, and with full payment made, will receive a number of trade passes for entry to the Show. These will be allocated according to the Stand size booked, with the minimum being 2 passes. The trade passes are intended for staff and other people involved with your Stand to gain access to the Showground. Further passes, or tickets for guests, can be purchased in advance as required at the advance purchase prices if payment is made prior to the Show.